Application adoption is key to maximizing performance and ensuring return on your software investment. 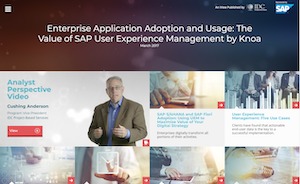 Knoa User Experience Management (UEM) provides visibility to measure application usage and identify inhibitors to adoption such as clunky user interfaces, process complexity and heavy customization. With the insight and the quantitative data provided by Knoa you can determine areas for improvement and implement changes across people, process or technology resulting in faster and predictable business outcomes. You can also leverage this data as a baseline to build measureable adoption KPIs as your business scales. By consistently measuring user adoption across all devices you can ensure employee readiness as new processes and technologies are introduced.